When dawn broke on the morning of 19th May 1536, Anne Boleyn was already awake, hearing the Mass and receiving the Sacrament from John Skip, her almoner, for the last time. She probably didn’t get much sleep at all the night before, preferring to spend her few remaining hours on earth preparing for her imminent death. 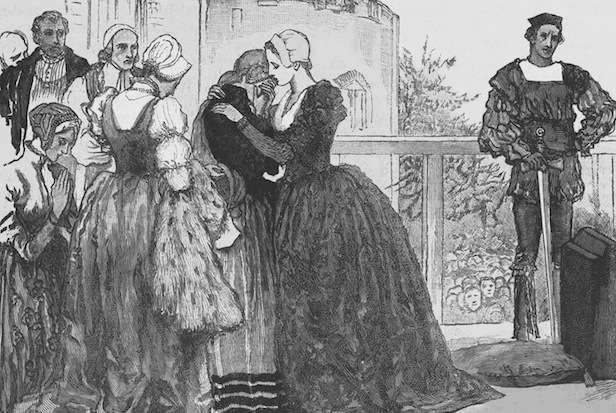 She needed to strengthen her resolve, which had been shaken the day before when Kingston, the Constable of the Tower Of London, had told her the execution had been postponed because the swordsman Henry VIII had summer from Calais before her trial had even begun hadn’t arrived yet. After breakfast, Kingston told Anne she should get ready. But she already was. Wearing a robe of black (the colour of death) damask trimmed with ermine, a crimson (the colour of martyrdom) kirtle, and a gable hood on her head, Anne made her way to the scaffold. Kingston helped her climb the steps. Anne looked at the crowd below her, among which were many of her enemies, such as Charles Brandon, Duke of Suffolk and Henry’s best friend, Henry Fitzroy, Duke of Richmond and the King’s illegitimate son, and Thomas Cromwell. Then, Anne’s ladies took off her mantle and hood, and tucked her hair into a cap so that the swordsman would be able to do his job more easily. Anne paid the executioner, who asked her forgiveness for what he was about to do. She then knelt down, upright, in the straw, and began praying. “O Lord have mercy on me, to God I commend my soul. To Jesus Christ I commend my soul; Lord Jesu receive my soul,” she repeated over and over again. 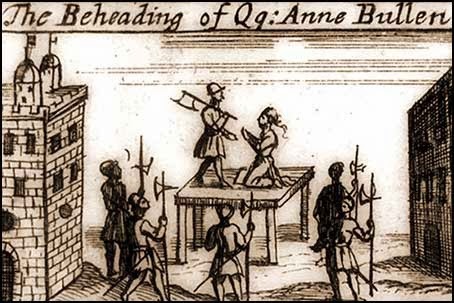 Although Anne appeared calm and dignified, she was also nervous, and kept looking over her shoulder, fearing the executioner would strike too soon. The executioner had concealed his sword. As he called out to his assistant to pass it to him, knowing that Anne would look that way, he quickly sneaked up behind her and, with one swift stroke, cut her head off. The Queen was dead. As the crowd dispersed, Anne’s ladies wrapped her remains in white cloth and buried them in an old elm chest, which had once contained bow staves, in the Chapel of St Peter ad Vincula. Her grave, as was customary for traitors, was unmarked.